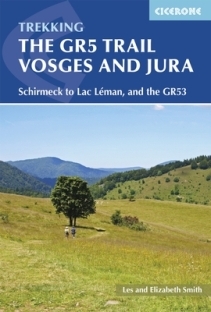 In April, Cicerone publish the 2nd edition of Les and Elizabeth Smith's guidebook to a 687km (427 mile) trek through eastern France, traversing the Vosges and the Haut-Jura plateau. Near France's eastern border, the three regional parks of the Ballons des Vosges, Northern Vosges and Jura Mountains contain verdant forests, amazing rock features and low rounded summits with spectacular views. However, despite the abundance of well-maintained paths, they are relatively very quiet and not main tourist trails. The scenery is varied and beautiful, from the forests of the Northern Vosges to the river gorges of the Jura, from ruined castles to the half-timbered villages of Alsace. 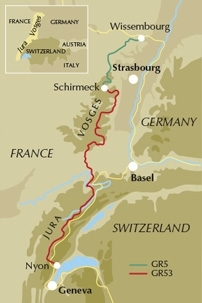 Starting in Wissembourg, the route follows the GR53 southwest to Schirmeck, before picking up the central section of the GR5 between Schirmeck and Nyon on Lake Geneva. It's within the capabiliy of most moderately fit walkers and is a clearly waymarked trek taking five to six weeks, although it could also be walked in stages. The guide presents the route in 11 chapters, which in turn are broken into short sections of a few hours each. There are also suggestions for shorter circular routes making use of sections of the GR53/GR5. There is a summary of local history, plants and wildlife and delicacies which can be found in the introduction and the appendices detail facilities available on route as well as full accommodation listings. This comprehensive guide is an ideal companion to discovering this interesting and varied route. We have copies to give away. Win yourself a copy and maybe it will inspire you to explore this beautiful stretch of eastern France. On Day 2 of our Jura Wine Trail, what grapes are you likely to encounter in the village of Pupillin? Send us an email to mark@highpointholidays.co.uk providing your name, a contact number, address and of course the answer, which you can put in the subject line.